Goodreads Description: People say when you take Heam, your body momentarily dies and you catch a glimpse of heaven. Faye was only eleven when dealers forced Heam on her and her best friend, Christian. But Faye didn’t glimpse heaven—she saw hell. And Christian died. My Review: A lot of my experience with this book could be summed up with simply: Ugh. 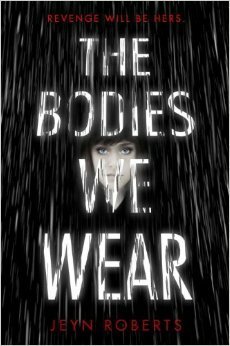 I was drawn to THE BODIES WE WEAR by its beautiful cover and interesting title. The hook didn't grab me much-- the tale of a streetwise punk hunting down dealers to get revenge for her best friend's murder. The idea was okay, but nothing about it made me shout 'ooh!' It was rather I wanted to see what the author did when dealing with teen drug use/abuse, the stigma associated, and how revenge and the street life affect someone as a person. The beginning stood out strong, and by this I really mean only the opening scene with Faye standing in the rain with the preacher who calls her out. 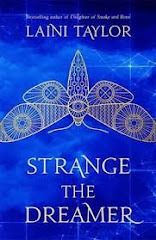 Some of these ideas brought up I really liked-- the conflict between religion and addicts, which was well done in the opening scene, as well as the question of the afterlife and what living really meant. It almost felt like the beginnings of some really awesome ideas that didn't get the attention they really deserved. Instead, we are stuck with a a dull main character who tries to convince us she's a rough and tumble street punk. Really, what has she done in her life? She's a good student, helps the poor and downtrodden, stands up for girls being beaten up in the bathroom, and yet she presents with the attitude of "this isn't normal for me. I'm one of the cool kids just HAPPENING to do the right thing." It was a serious case of an author leading their audience, attempting to tell them what to think of their character instead of showing it. Not to mention our love interest, Chael, is about as transparent as glass and about as interesting. His story was horribly predictable (from the first moment he entered it was obvious as to what's really going on with him, though the story never explains the HOW or reasons behind what happens to him). He came in to be the mysterious protector who would "save Faye from herself." I couldn't find anything likeable about him, especially once he begins to do the mysterious "I know things but you need to figure it out for yourself." Barf. I'll tell you, if the guy I was dating constantly lorded information over me in such an arrogant way (especially coupled with his stalker tendencies) I'd clock him one. Which feels like something Faye should have done, but somehow six years of street life are completely forgotten when cute boys enter the picture. The characters felt like they didn't make a lot of sense. Mostly, the construct of the society made no sense to me. Here we have a drug that is outright killing people from the first dose and anybody who has so much touched the stuff is instantly ostracized. I can... sort of understand this, but it didn't make much sense to me. People are afraid of drug use in real life because it changes their loved one. Makes them more aggressive, brings out odd behaviour, it causes them to lie and cheat those they love to put the drug first. Yet we didn't see any transformation from the use of Heam. Its users saw Heaven, and if they overdosed and got scars, (evidence of their use) they were essentially tossed aside. The author pushed this addict stigma to the point where it was horribly unbelievable. I can't believe a mother could one day go from "My baby girl" to "You're a horrible monster get out of my face," by the presence of a few marks. Therefore, the whole stigma of Heam use mostly made me roll my eyes. Aside from the characters, the thing that really bothered me was how this book presented drug use/abuse. The environment was very black and white-- bad guys and victims. The villains in this book were not people-- they were drug dealers, pedophiles, murderers. It felt like the author compiled everything evil into a person and then set them up as pins to be knocked down by our main character. There was no way we could sympathize with them, which took out a huge point of conflict. They're still human, someone out there must have loved them. Instead of drawing up the dilemma of "these are humans too, no matter what they've done, and I'm going to kill them." Instead, we get, "He deserved it, but killing him didn't make me happy," which felt incredibly selfish and short sighted, not so much on the character's side but the author's. Emotions run much deeper than that. On the other hand, we had the victims-- little kids who are doing this drug, who had it forced upon them, who are poor little sufferers in this cruel society. It made me scoff. Yes, there are always those sob stories, but drug use is filled with people who seek out the drug, who go to it to escape pain in their real lives. The book completely neglected those people. Characters were either the devil or the poor, trapped and helpless. It would have been much more fulfilling to see the addicts who use it to escape, but also enjoy it. They do this for a reason. Let's get into their heads. See what they're really running from. Often drug addicts seem like evil, but the real evil is often lurking behind them, from something done to them that they're only trying to cope with. I wanted this book to look at the complexities of addiction and street life, and instead got a Disney-esque, black vs. white story of people who are given drugs, rather than people who take drugs. All in all, there were some poignant moments and a few really interesting thoughts that kept me interested, but sadly, it was too far and between.